The Notre Dame Scholars' Program educates students to be scholars, servants, and leaders. The Notre Dame Scholars' Program selects prospective first-year Notre Dame students to receive merit-based scholarship awards based on their highly competitive academic records, demonstrated leadership, and service to their communities. The University of Notre Dame currently offers more than 20 such scholarships, which typically provide recipients with an annual award of $25,000, for a total of $100,000 over four years, and in some cases generous enrichment funding for scholarship, service, and leadership projects. Building on the success of Notre Dame's first merit-based scholarship program, The Hesburgh-Yusko Scholars Program, the Notre Dame Scholars' Program now offers advising, programming, and curricular opportunities to more than 350 Notre Dame students who receive scholarship funding. These include recipients of the Notre Dame Stamps Scholarship, which provides a full tuition award and $12,000 of enrichment funding. Recipients of all merit-based scholarships at the University participate in a one-credit Ethical Leadership class, receive personalized mentoring from program staff, and are invited to participate in a variety of extracurricular professional development and service events throughout the course of the year. Students who entered the program in fall 2018 also enrolled as a cohort in courses that fulfilled University requirements and worked with program staff to develop relationships with faculty mentors. The University anticipates that in 2019, approximately 100 merit scholarship recipients will join the Notre Dame family as first-year students. Love is a Biology and Mathematics major and a student in the Glynn Family Honors Program. During the summer of 2018, she worked as a research assistant in the Vonderheide lab at University of Pennsylvania researching targeted cancer therapy. 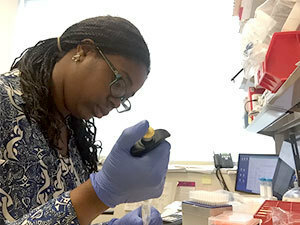 While on campus, she is an undergraduate research assistant in the Schafer Lab, where she examines cancer metastasis and cell death in breast cancer cells. She is Vice President of the Biology Club and Logistics Chair of the Multicultural Pre-Med Society. She has also worked as a Scribe in the Emergency Department of St. Joseph Regional Medical Center.